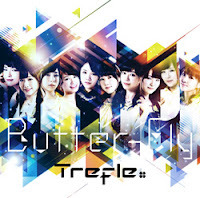 Tamer Union: Trefle's Debut Single Will Be Digimon Adventure's "Butter-fly"
Trefle's Debut Single Will Be Digimon Adventure's "Butter-fly"
On November 18th, 2015, the all-girl band A&G Girls Project Trefle will be releasing their debut single Butter-fly/One Time featuring their cover of Digimon Adventure's opening theme, Wada Kouji's "Butter-fly." Last August the musical group did a thirty-second preview video of the cover, which was filmed in 360 degrees, allowing fans to freely rotate the camera to see different angles of their performance. The YouTube preview is geoblocked in the United States, but can be heard on Tumblr.